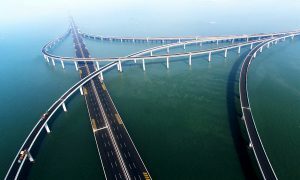 Jiaozhou Bay/Qingdao-Haiwan Bridge, China. Photo: Feel the Planet (feel-planet.com). Dr Paul Buchanan, founder of 36th Parallel Assessments. The latter is an important point. Although a Pacific island nation, New Zealand is, by virtue of its colonial and post-colonial history, a citizen of the West. The blending of Maori and Pacifika culture gave special flavor to the Kiwi social mix but it never strayed from its Western orientation during its modern history. That, however, began to change with the separation of trade from security relations as of the 1980s (where New Zealand began to seek out non-Western trade partners after its loss of preferred trade status with UK markets), followed by increasingly large waves of non-European immigration during the next three decades. Kiwi culture has begun to change significantly in recent years and so with it its international orientation. Western perspectives now compete with Asian and Middle Eastern orientations in the cultural milieu, something that has crept into foreign policy debates and planning. The question is whether the new cultural mix will eventuate in a turn away from Western values and towards those of Eurasia.